I take a deep breath, step onto the carpeted stage, and turn to the audience, ready to make my stand-up comedy debut. But whatever nerves I wrestled with in the previous two hours have been pushed aside for a startling realization: I can’t see the crowd. Stepping onto the stage overwhelms my senses, not unlike leaving a darkened basement for an open meadow on a sunny day. With banks of bright lights looming above, I squint to gather my bearings and peer into what’s left of the crowd. Even the tabletop candles aren’t flickering anymore. I might as well be performing into a cave. I first considered taking the stage in November 2011 as part of an effort to lead a fuller, more exciting life. A friend and I even showed up to a Portland comedy club one night, only to find out the evening’s open mic session had been canceled. Outwardly, I expressed dismay. Inwardly, though, a weight had been lifted. I retained my dignity without subjecting myself to the vulnerability of a stand-up comedy debut. Over the next few weeks, I invented reasons why I couldn’t make various open-mic nights until the last of my friends stopped asking. 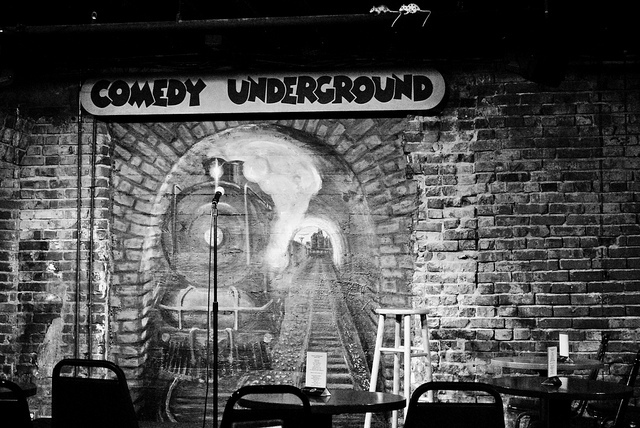 Eight months later, I moved to Seattle and forgot about my flirtation with stand-up comedy. But after another seven months, spurred by a resurgent desire to try something new, the itch returned. I spent a weekend crafting – and the next month memorizing – a three-minute bit about my smartphone addiction. I joked about pulling my phone out at stop lights, expressed my love for Siri, and compared a broken phone to a cheating girlfriend. I dropped some jokes into casual conversation, measuring the reactions and growing more comfortable with the material. Finally, I locked down a date and found a friend to cheer me on. That’s how I arrived at Comedy Underground on this drizzly April evening, waiting to sign up and wrestling with warring emotions. On one hand I thought, I’m taking a risk and getting a good story from the experience. Then again, I’m half-wishing to get bumped to another night, allowing me to start the excuse-making all over again. The hardest thing about going through with this, I realize, is actually going through with it. By the time I scan the list and see that I’ll perform last, I’m three beers in and more relaxed. With two hours until my three-minute set, my friend Lauren and I settle in and size up my competition for laughs. As I observe the mirthless wreckage before me, I grow emboldened and think, “I’m way funnier than most of these clowns.” But another inner voice chimes in, wondering if I really know something they don’t about the difficult world of stand-up comedy — a world which, until now, I’d only ever experienced as a spectator. Before I can make sense of my inner dialogue, the host calls me to the stage. I am confident about the material but, unable to see the audience from the ankle-high stage, feel pinned to the brick wall behind me. I turn from side to side, looking for a friendly face, but am stonewalled by the darkness. I stutter and stammer through my bit, eliciting a handful of chuckles here and there. Some jokes, like the one where I compare my previous phone to Old Yeller, are met with stony silence. I never deliver the punchline to one joke and try improvising another, earning what might be a guffaw, but is more likely someone shifting uncomfortably in their chair. After two minutes, the red warning light appears like a beacon in the back of the room, signaling that my time is nearly up. I wrap up, thank the 30 or 40 audience members who stayed for the whole set, and return to my seat amid a smattering of applause. Back in the darkness, I avoid eye contact with the other would-be comedians while trying to process the previous few minutes. Outside, I allow myself a deep breath of cool Seattle air as relief takes hold. On our way to the bus stop, Lauren asks about my time on stage and recounts the reactions I couldn’t see or hear. I don’t give a second thought to the deafening silence that greeted some jokes or the chuckles that followed others. Only now do I realize that this three-minute set was never really for them; the risk, the writing, the performance, it was all for me. More than anything, I’m just glad I went through with an unforgettable new experience. I couldn’t see their bored grimaces or half-cocked smirks, but none of that matters. What matters is that I stepped out of the darkness and onto the stage. What matters is that I wasn’t scared away by the bright lights.